Back in Black. 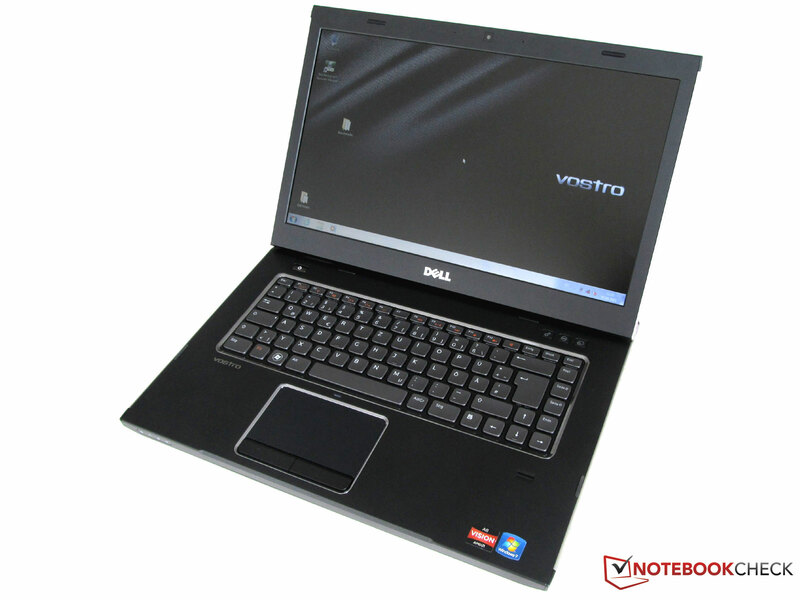 Dell is currently offering the Vostro 3555, the new member of the existing Vostro family, for around 500 Euros. The black 15.6 inch model is equipped with a quad-core CPU, 6 GB RAM and the Radeon HD 6620G graphics chip. A special highlight of the notebook is the backlight keyboard which makes typing in the dark easy. 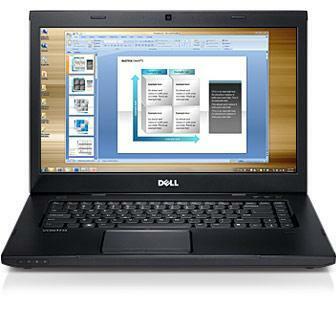 The Dell Vostro 3555 with AMD Vision technology is a new addition to the existing Vostro series. 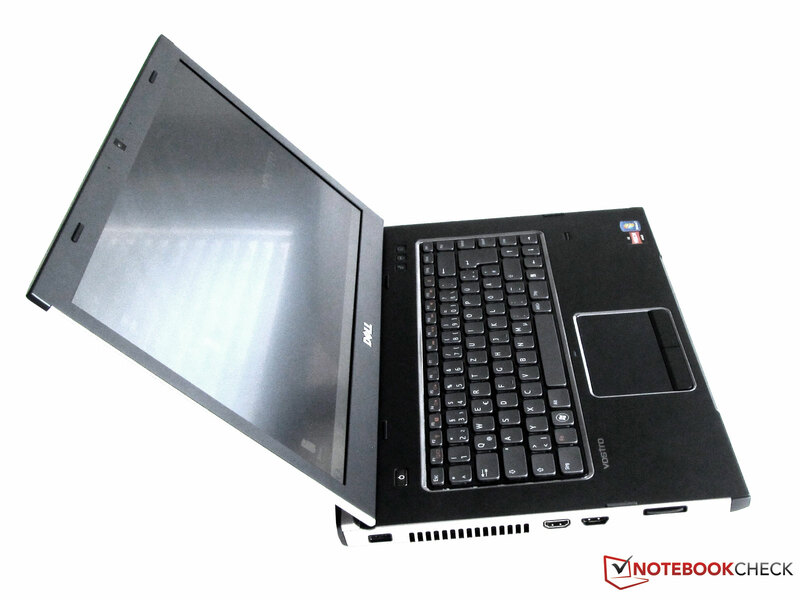 This notebooks employs the AMD A8-3500M CPU which has an integrated graphics chip. This graphics chip takes care of all of the laptop's graphics. The quad-core processor has a standard clock frequency of 1.5 GHz and activating the "Turbo" mode can boost the clock speed of the processor and coax more performance out of the unit. The Vostro 3555 has a 15.6 inch anti-glare display which runs at a native resolution of 1366x768 pixels. 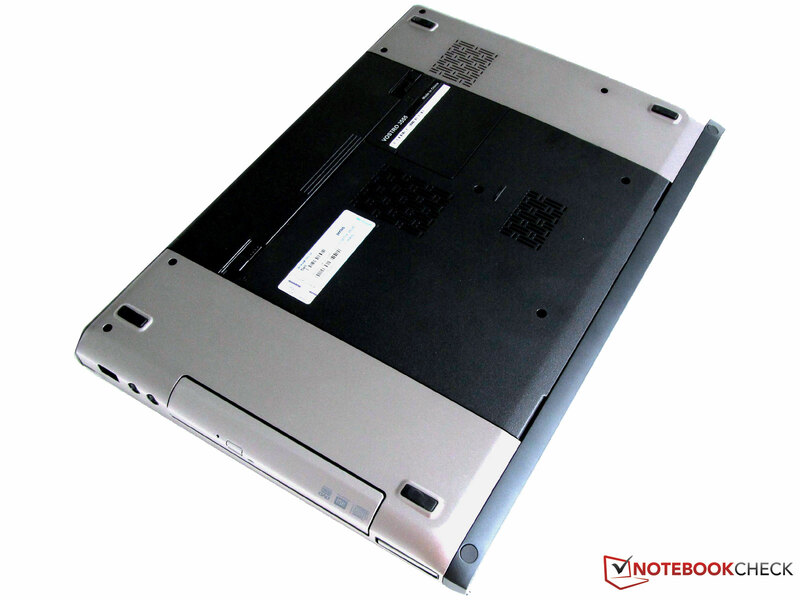 Our test model also has 6 GB RAM, a 2.5 inch hard disk with a capacity of 750 GB and a DVD burner. Dell has intalled a full HD webcam in this model as well. The RAM size and modules of our test model are unusual: two different modules are installed - a 4 GB Samsung module and a 2 GB Micron module. The Dell Vostro 3555 costs around 499 Euros (including taxes). The case of our test model is almost identical to that of its Intel-based predecessor: the Vostro 3550. The main difference between the two models is the case color; instead of red, Dell has picked a smooth platinum mix with a little copper for the Vostro 3555. Our test model has a plain yet attractive exterior. All of its inside surfaces are matt black. The keyboard and the touchpad each have a silver border which sets them apart from their immediate surroundings and adds style to the laptop. Closing the laptop transforms the matt black device into a laptop with an exquisite brushed aluminium design. The display cover, the sides and about half the bottom of the notebook are made of brushed aluminium. 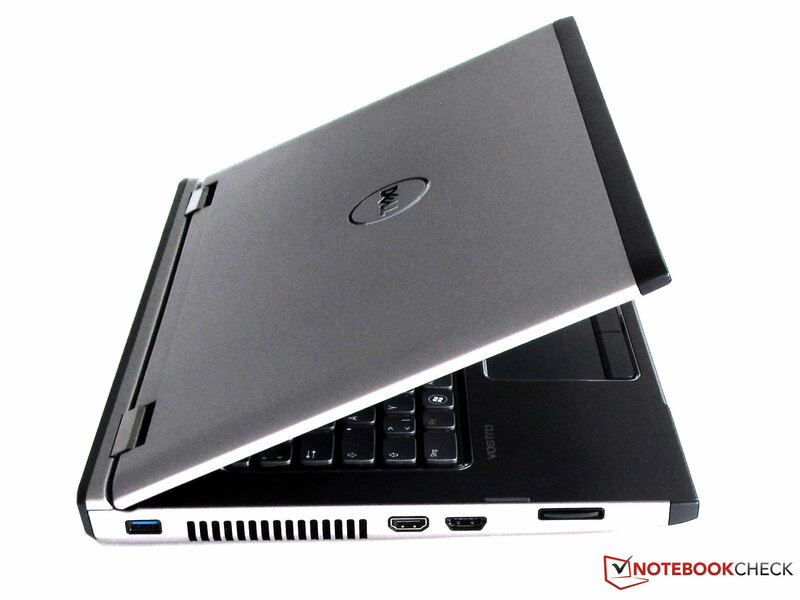 The reliable material provides the laptop the necessary sturdiness. The display cover can be forced inwards at certain spots. For example, near the middle of the display (in the area of the Dell logo), the cover can be pushed inwards. Thankfully, the cover proves to be sufficiently resistant and prevents the user from pushing all the way through to the panel. 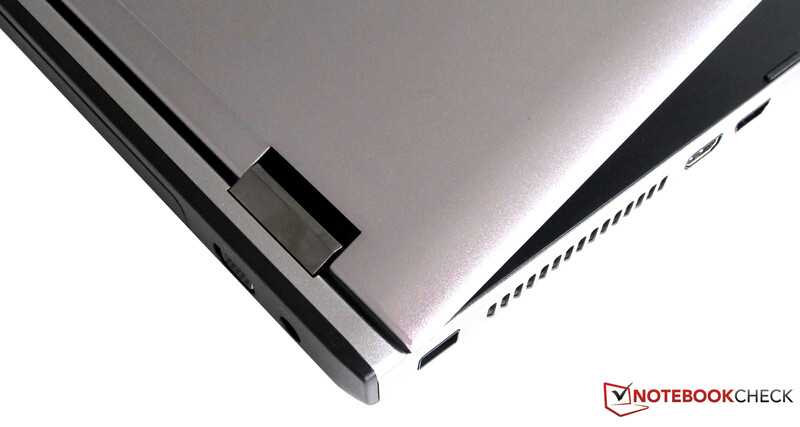 The two hinges hold the display well, but the screen still trembles slightly when the base of the laptop is moved. The base unit is even sturdier than the display cover: all the parts here sit well and do not squeak or move. The hand-rest regions, the keyboard, and the touchpad are all quite resistant to force. The surfaces did not give way under pressure, except near the optical drive, where the material can be pushed inwards slightly. Overall, the workmanship of the notebook is decent. We did not notice any faults in the design. 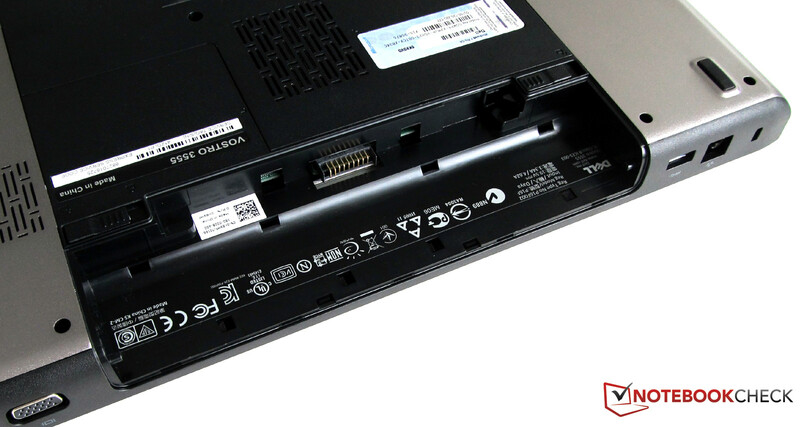 The display can be easily opened, and clatters slightly when closed as Dell has not installed a locking mechanism. 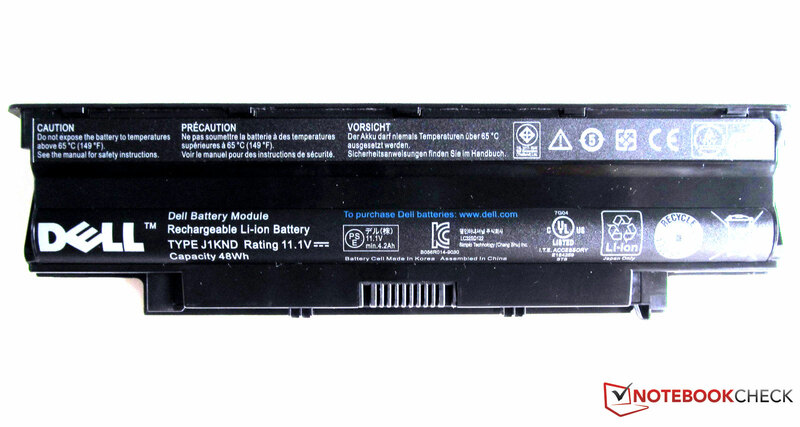 The Dell Vostro 3555 weighs (including the 6 cell battery) around 2.47 kgs. The power adapter adds another 390 grams to that figure. The measurements of the laptop are 35x375x260 mm, and the laptop is thinnest near the front - 30.4 mm. Our test model has ports on all sides, except the front (like in the predecessor: the Vostro 3550) and all the interfaces are positioned well. 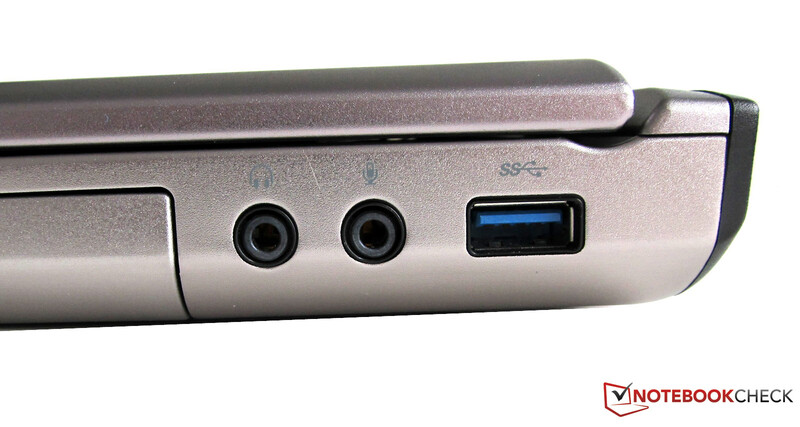 A total of three USB 3.0 ports are available on the laptop. 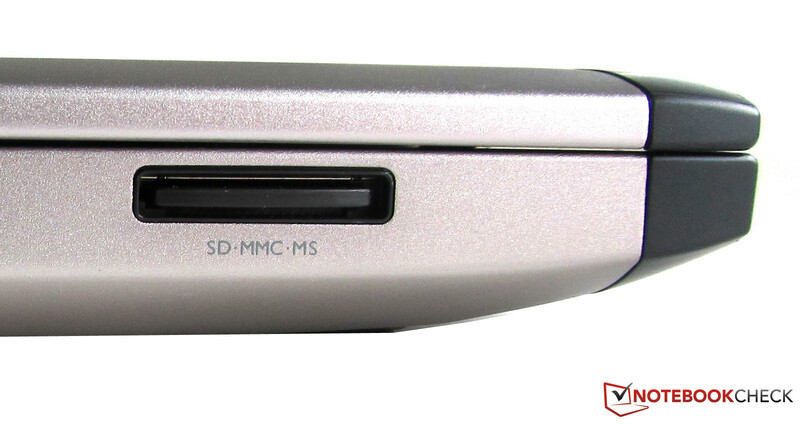 Each side (the back, right and left side) has one USB 3.0 interface. 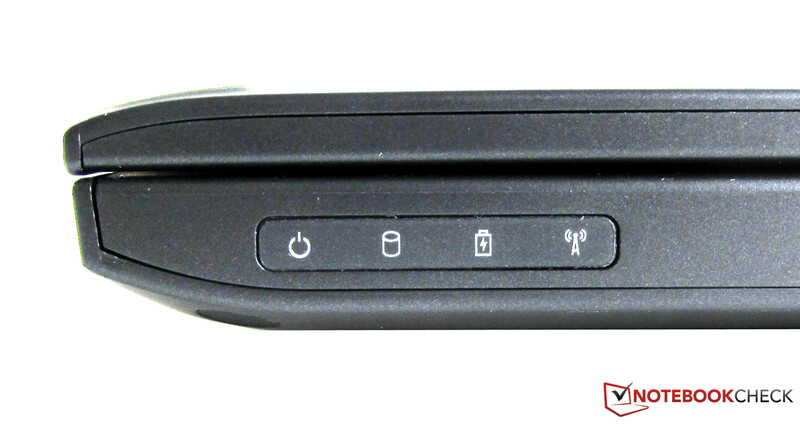 The laptop also offers an ExpressCard 34mm slot, a DVD burner, two audio jacks (1x headphones, 1x microphone) on the right side. On the left side, a cardreader, an eSATA/USB2.0 combo interface and a HDMI interface are placed. 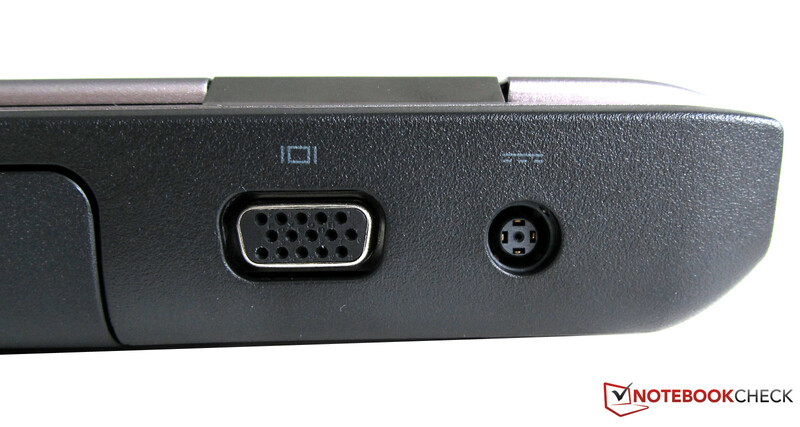 A RJ45 LAN port and a VGA interface can be found on the back. The positioning is quite good, and the user can use any port without the fear of blocking any of the bordering ports. 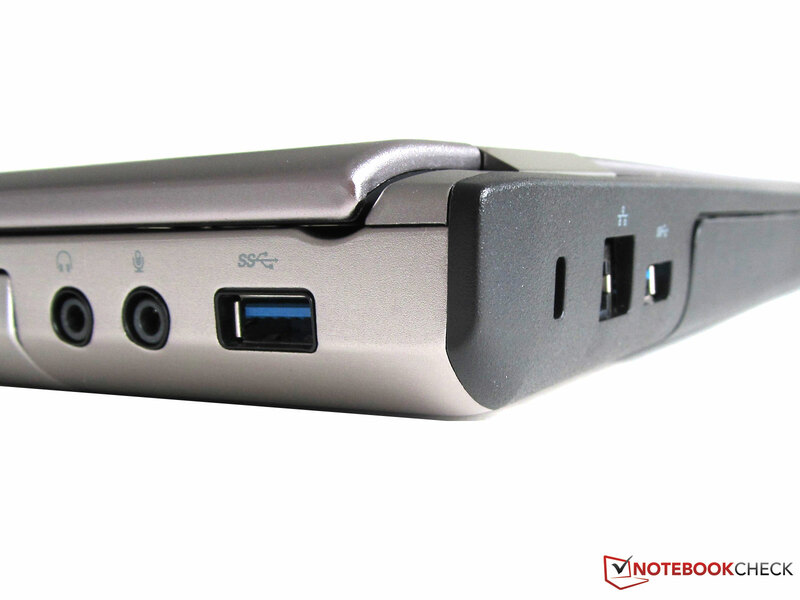 The front of the laptop has not ports, and notebook lacks a docking port interface on the bottom. 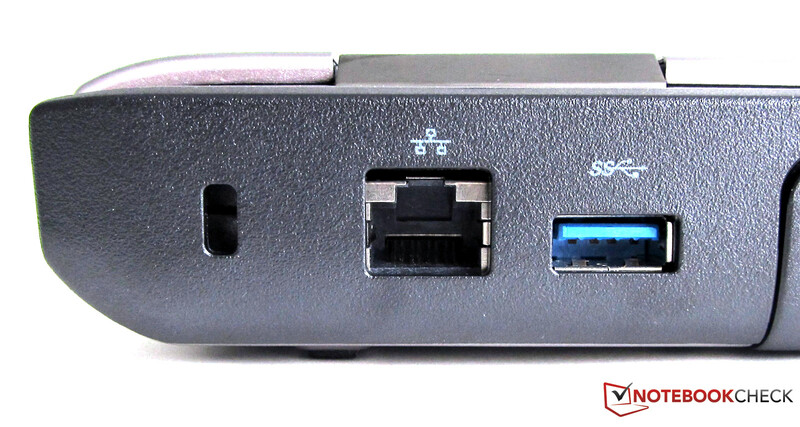 The user can use the RJ-45 port on the back (Gigabit-LAN) for a wired internet connection or the Wireless-LAN module (802.11 b/g/n) to surf wirelessly on the web. The laptop also has Bluetooth 2.0+EDR. Sadly, a 3G-/UMTS-compatible modem is not installed. The Vostro 3555 offers extensive security functions. 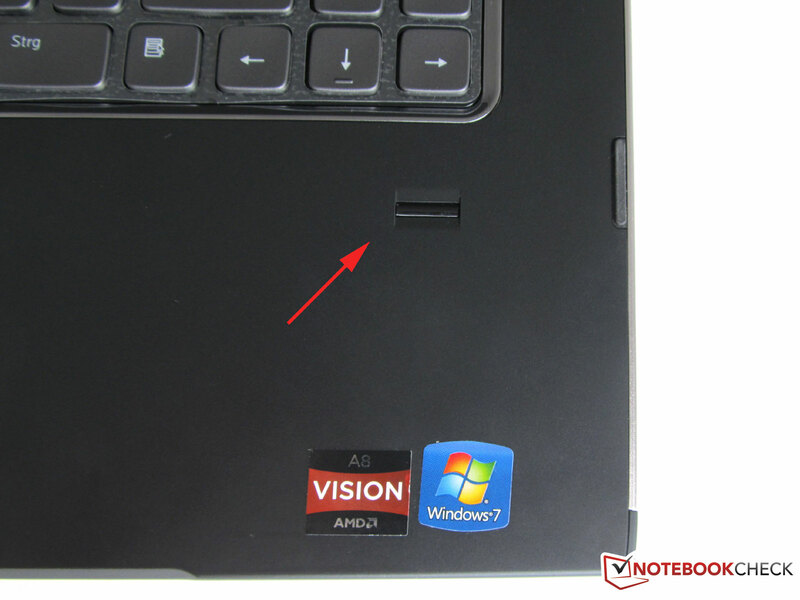 The laptop has a fingerprint scanner which allows the user to use biometric protection for the computer log-in. The fingerprint scanner can also be used with the DigitalPersona software for other log-ins, such as an email client. The anti-virus protection offered by Dell consists of McAfee Security Center and Trend Micro Worry-Free Business Security Service, which is free for 15 months. In addition, Dell also has Absolute Data Protect, in the form of LoJack (starter version), pre-installed. After registration (which requires payment) the laptop can be traced if lost. The delivery package includes a few DVD drives and three multi-lingual manuals in addition to the notebook and the power adapter. The DVD drives contain the Windows 7 Professional 64 bit operating system (incl. SP1), the Worry-Free software from Trend Micro and drivers, as well as necessary applications, such as Microsoft Office 2010 (Starter, with ads). The guarantee period for the basic configuration is 12 months. This includes pick-up and repair service. In the Dell online shop the buyer can configure the installed modules and the delivery package contents to suit his/her preferences. An Accidental Damage Protection service is not provided by Dell for this model. Dell offers an additional ProSupport service in addition to the one year pick-up and repair service. The ProSupport service includes on-site service on the next workday and costs about 80 Euros/year, and 160 Euros for 3 year. A standard service is also available which includes "service on the next workday" for 65 Euros/year and after 3 years, the user gets a discount and but the guarantee for another 3 years at 130 Euros. The keyboard of the Vostro 3550 is identical to that of our test model as it also has background lighting. This features allows the user to clearly discern the characters on the keyboard even in the dark. 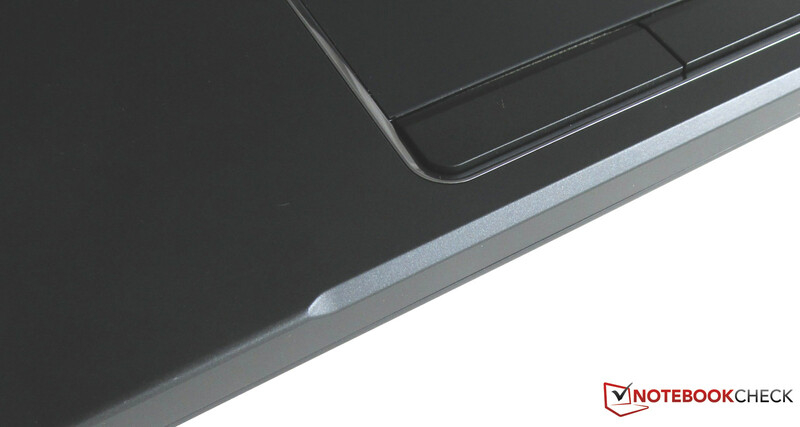 A big touchpad with a black surface is placed in front of the keyboard of our test model. 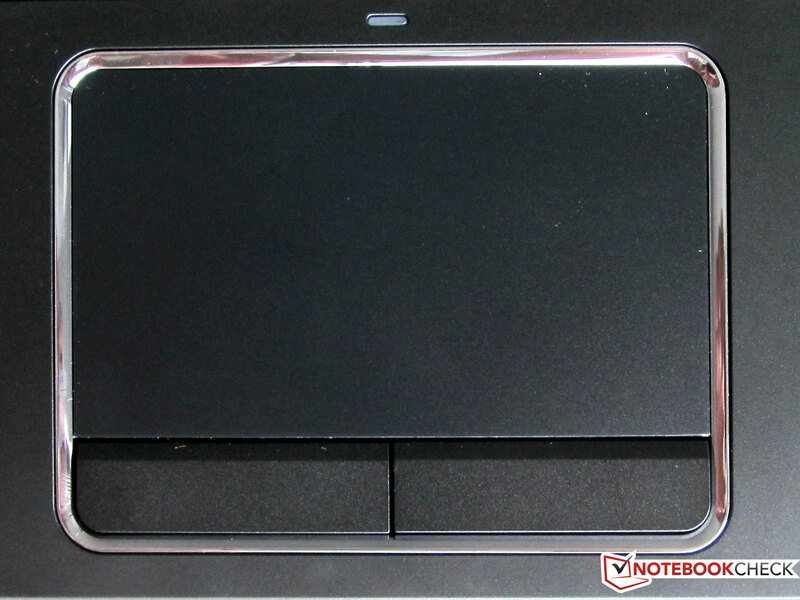 The touchpad supports multi-finger input and gestures like the touchpad of the Vostro 3550. 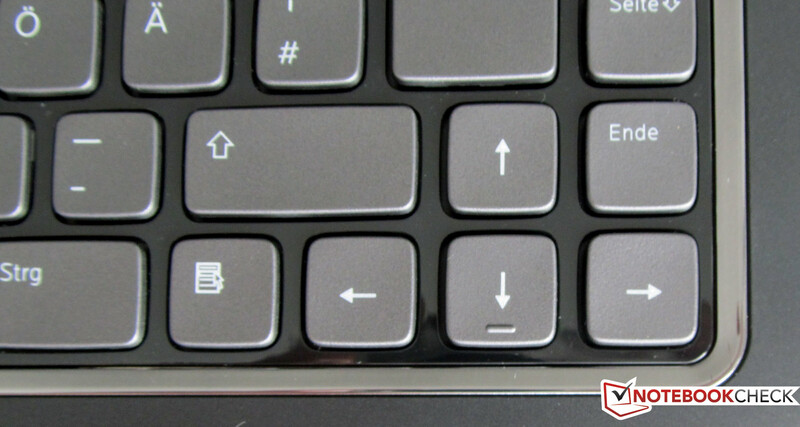 The touchpad has two keys which serve as the right and left buttons of a mouse. The user can easily deactivate the touchpad by pressing "Fn+F3". The user is automatically notified by the computer when the touchpad is de-/activated (by a pop-up on the screen) and a LED above the touchpad turns on when the device is off. The 2 megapixel HD webcam is placed in the top center of the 15.6 inch display and it can take pictures and videos. Our test model has a 15.6 inch display, which has a resolution of 1366x786 pixels and an aspect ratio of 16:9. The screen is anti-glare which means that it does not have annoying reflections. 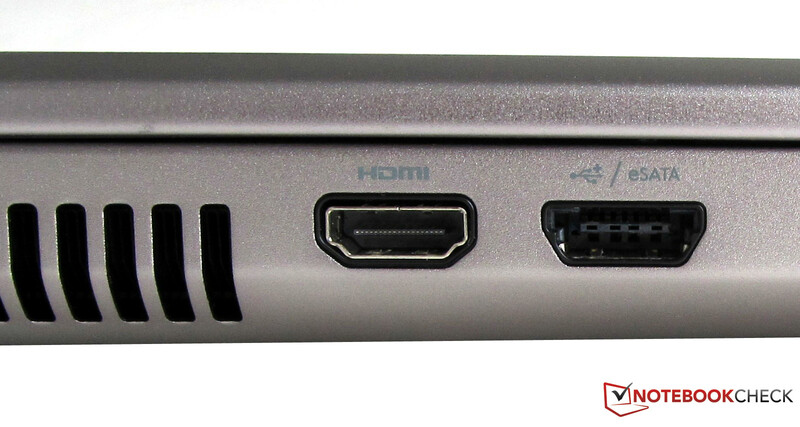 External monitors/TVs can be connected to the notebook via the VGA (on the back) or HDMI (on the left side) interface. The panel used in our test model is named the AUO23EC. 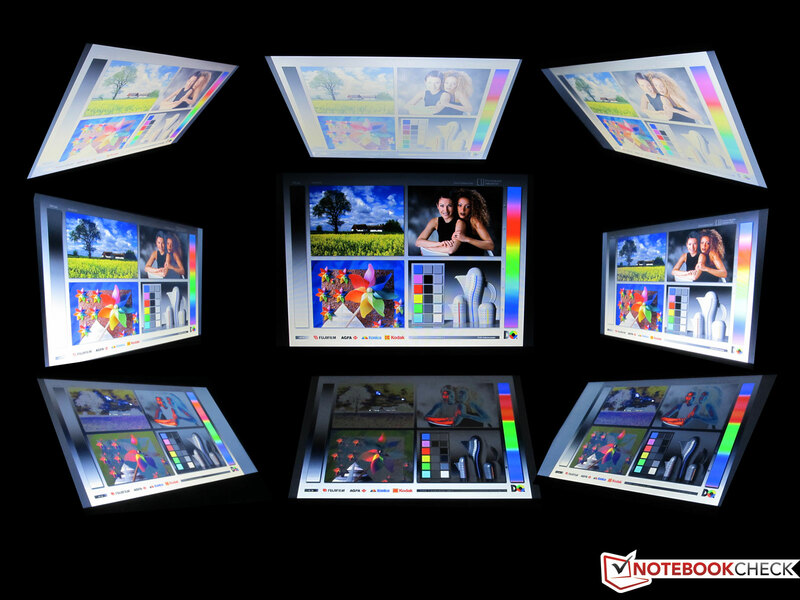 This is a different panel than the one tested in Intel-based Vostro 3550 (LGD02E3). The integrated AMD Radeon HD 6620G chip of the CPU is responsible for the graphic output. Unfortunately, this graphics chip lacks its own VRAM (video memory), and as such must use the installed main memory modules. 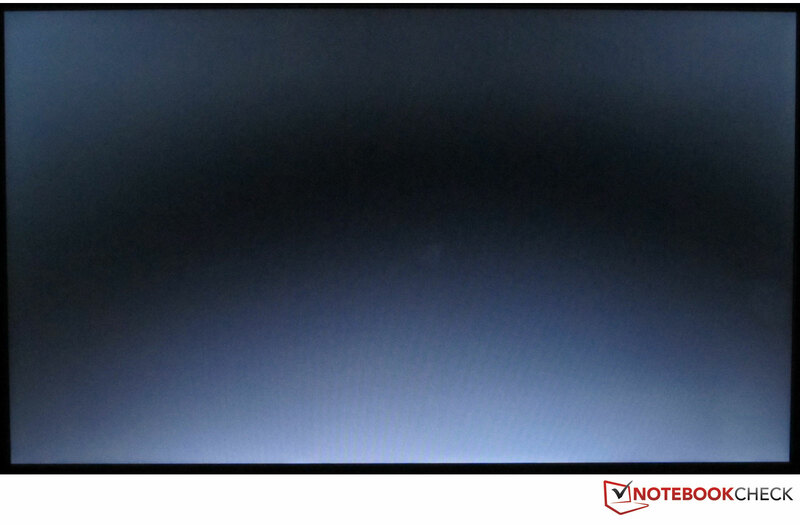 This is how a pure black picture appears on the screen of the Vostro 3555. We measured 9 fixed data points on the display while it was set to maximum brightness. The values ranged between 164 to 180 cd/m² (the average lies at 170.8 cd/m²). The illumination of the display is 91 percent. These values indicate that the panel is much darker than the panel of the Vostro 3550. We measured the contrast while the display was at maximum brightness. The contrast of the panel lies at 189:1 and black value is 0.87 cd/m². We noticed that the top corners and the bottom screen edge of the display were distinctly brighter when the screen was showing a black picture. This effect seemed like a "Bad Smiley" and affected the overall viewing experience negatively especially when watching dark sequences in videos. The colors are displayed quite well by the panel. Sadly, the measured color space falls far short of the professional Adobe-RGB and sRGB color spaces. The display delivers an acceptable picture outdoors in direct sunlight. The contents of the 15.6 inch screen were clearly legible and the colors of our test video were also clearly visible. The brightness fell noticeably, but this should not hinder users while writing a mail or doing office work as these tasks usually use a brighter background. As such the user will be able to stand this effect, even though longer periods of use will strain his/her eyes. The stable viewing angles of the display are severely limited. The content on the screen is displayed with strong colors and good contrast as long as the user is sitting right in front of the screen. However, as soon as the user changes position, the picture inverts or brightens up. When the display is turned to an angle of +45 degrees or -45 degrees the content of the screen no longer remains recognizable. At these angles, the content displayed by the screen is too inverted or bright, making it impossible for us to recognize the contents. The Dell Vostro 3555 uses a quad-core CPU from AMD. The A8-3500M with AMD Vision runs at 1.5 GHz (32-nm production processor with 1000 million transistors on a DIE size of 218 mm²) and has a 4 MB Level 2 cache. The APU (Accelerated Processing Unit) can work on four threads simultaneously and has Turbo core 2.0 (equivalent to Intel's Turbo boost technology). When this "Turbo" mode is activated the CPU speeds up to 2.4 GHz. This means that the respective cores of the APU can be easily overclocked as long as there is sufficient cooling. The A8-3500M also contains the memory controller and the graphics chip. We tested the ports for any possible latency problems with the DPC Latency Checker tool. This software allows us to check for synchronization problems the computer might have with external hardware. As shown by the screenshot, all the values remain in the green region. Synchronization errors tint the green bars red, and if no red points are visible, then the system is free of latency problems. As the graph points are all in the green, we can safely conclude that the laptop has no synchronization problems with external devices (especially no audio or video interference). The Vostro 3555 hit 2085 points in Cinebench R10 (Single Rendering - 64 bit mode) which places it at the same level as a Core i3 2357M @ (operating at) 1.3 GHz or an Athlon II P340 @ 2.2 GHz. In the Multi Rendering test (64 bit) of the same benchmark, the test model reached 6852 points. This score is comparable to the performance delivered by an AMD Phenom II X4 P960. The test model scored 1.88 points in the latest Cinebench R11.5 benchmark (CPU 64 bit calculations). The laptop reached 5030 points in the PC Mark Vantage. The score is not as bad as it seems when compared to the performance of an Intel Core 2 Duo P7550 or an AMD Phenom II X4 P960. In PC Mark 7 (the latest benchmark) the test model reached a score of 1634 points. In our direct comparison with the previously tested Vostro 3550, we noted that our test model scored far lower. On average, the Dell Vostro 3555 scored 56% lower than its predecessor (the Vostro 3550) in Cinebench R10. However, this is probably due to the stronger Core i7 2620M (@2.7 GHz) in the Vostro 3550. Even in PC Mark Vantage (-35%) and PC Mark 7 (-20.6%) our test model scored lower. Our test model uses the graphics chip integrated in its APU for its graphic output. The model's integrated graphic chip is the AMD Radeon HD 6620G which supports DirectX 11 and supposedly performs at the same level as a mobility Radeon HD 5650 middle-class graphic card. In addition, the AMD graphics chip is supposedly much faster than the Intel integrated HD Graphics 3000 chip which is used by second generation Core i-processors. In the Futuremark benchmarks, the graphic and 3D performance of the AMD Radeon HD 6620G lay at the expected levels: 15023 points (3D Mark 2001SE), 10589 points (3D Mark 03), and 7033 points (3D Mark 05). 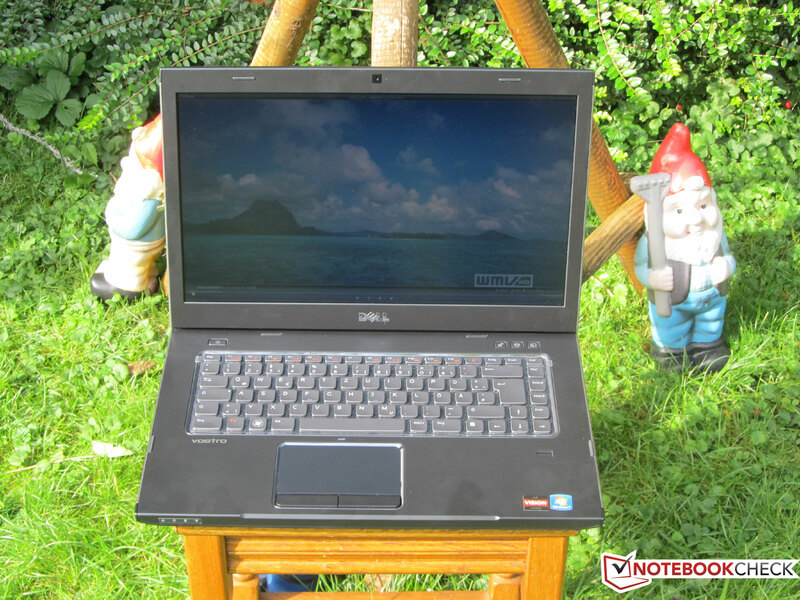 The Dell notebook performed especially well in 3D Mark 06: 4053 points. Finally, in the latest Futuremark graphics benchmark, the 3D Mark 11, the integrated graphics solution scored 809 points. Against a Radeon HD 5650 the integrated graphics chip of the A8-3500M processor loses by around 29.4% on average (3D Mark 2001SE: - 26,4%, 3D Mark 03: - 40%, 3D Mark 05: - 28%, 3D Mark 06: - 43,7%, 3D Mark 11: - 9,7%). When we compared the graphics performance of both Vostro models (the 3550 and the 3555) we noticed that the successor has lower graphics performance. The Vostro 3550 uses a Radeon HD 6630M, whereas the 3555 employs a Radeon HD 6620G. The benchmark results indicate that the Vostro 3555 scores on average 31% lower than the Vostro 3550. In our direct comparison, we noticed that the AMD Radeon HD 6620G performs around 13.6 percent better (clear increase) than the integrated HD Graphics 3000 (second generation Core i- series). The core temperatures of the four cores of the A8-3500M CPU barely rose during our stress test (high load on CPU and GPU using prime95 and Furmark). The clock frequency of the processor wavered slightly in the region of 1.5 GHz, and Turbo mode was barely used. The clock frequency fell down to 200 MHz for a short while. In our 90 minute stress test, the standard clock frequency (@1.5 GHz) of the APU remained constant almost the entire time. 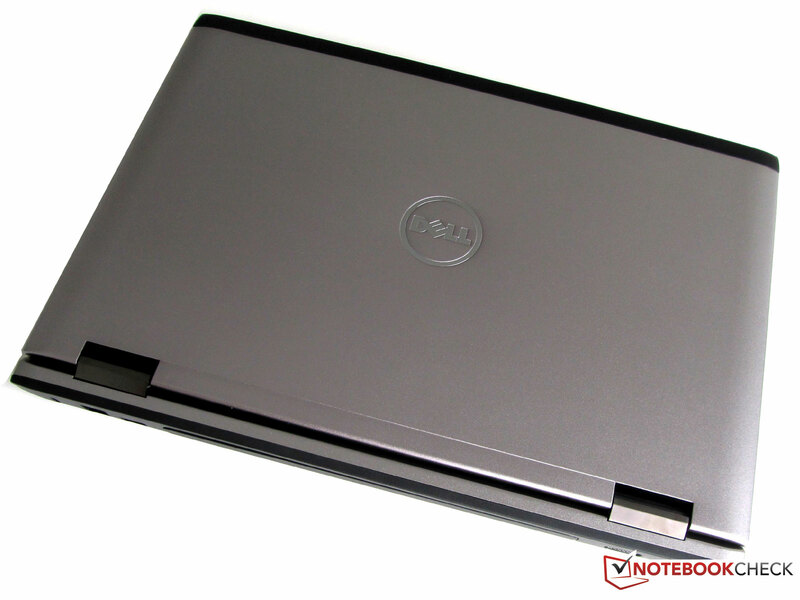 The Dell Vostro 3555 uses a 2.5 inch drive from Seagate for data storage. The hard disk has is the model ST9750420AS which runs at 7,200 rpm and has a capacity of 750 GB. The hard disk belongs to the Momentus series and has a Serial-ATA interface with a cache of 16 MB. The average transfer rate of 91.9 MB/s was measured using "HD Tune Pro". The burst rate lies at 155.1 MB/s. These values are confirmed by two other test programs: the "Crystal Disk Mark" and "AS SSD". The AS SSD tool is intended for SSD models but it works fine with hard disks as well. The integrated graphics of the A8-3500M-Prozessors (AMD Radeon HD 6620G) performed well on all the tested games. In "Dirt 3", "Trackmania Nation Forever" and "Fifa 11", the integrated AMD graphics could deliver up to 170 fps (frames per second) at a resolution of 800x600 pixels. With a 1024x resolution, the performance dropped: Dirt 3 at 36 fps was still "playable"). Fifa 11 and TMN performed better and could be run in all resolutions. The demanding "Mafia 2" game ran on the test model with a 800x pixel resolution at 35 fps. In comparison: a HD Graphics 3000 (integrated graphics chip of the Sandy Bridge processors) could only run Mafia 2 at 9 frames per second in a resolution of 800x600 pixels. To see which games run on the AMD graphic chip and how well they run, please take a look at our in-depth performance table which includes the latest games: "Computer Games on Laptop Graphic Cards". Mafia 2: Low frames - almost not "playable"
The ventilation openings on the sides are the exits for the heat exhaust of the cooling system. Although the Vostro 3555 does not run a very high-performance CPU (A8-3500M), the cooling fan is always running (even when idle). While idle, the noise emissions from the laptop were around 33.3 dB(a). The playing of a DVD caused the emission to jump slightly to 35.9 dB(a) (distance between laptop and measurement device - 15 cms). Even under full load, the laptop only emits 35.9 dB(a). The in-built hard disk runs quietly at 32.1 dB(a) despite the fast operating speed of 7200 rpm. The noise emissions have dropped in comparison with the predecessor. The temperature emissions remain low during our tests. 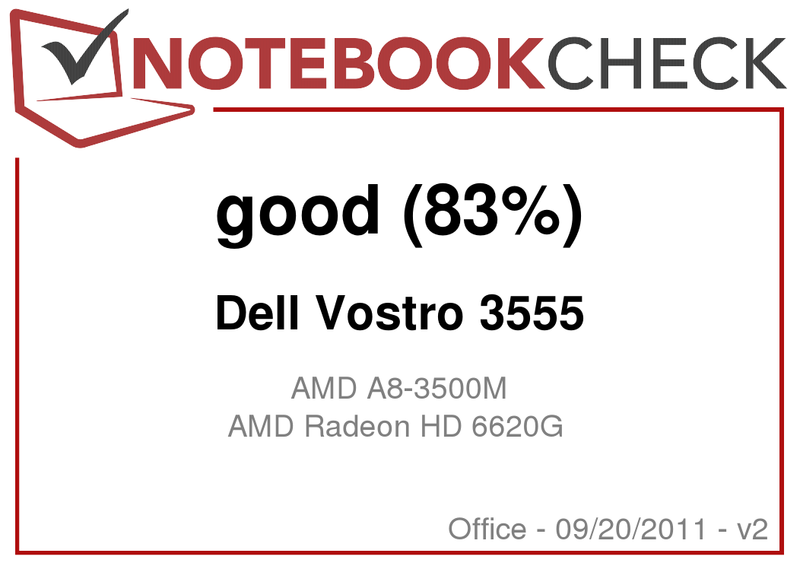 The Vostro laptop performed well thanks to its power-conservative CPU (AMD A-Series A8-3500M), and the temperatures of the 3550 remained well below its predecessor: the Vostro 3550. The laptop ran relatively cool even when the hardware was under full load - around 40.6 degrees Celsius (near the middle of the bottom of the notebook). Other laptops were breaking the 50 degrees limit under the same conditions. The surface remains cool in front of the keyboard and near the touchpad, reaching a maximum of 30.6 degrees Celsius. When the laptop is idle or when the user is doing some light office work or surfing on the web, the temperatures on the surface stayed at 29.5 degrees and at the bottom at 33 degrees Celsius. The power adapter had to deliver high performance during the stress test and it became relatively hot. The temperature measurements ranged from 53 degrees Celsius while the laptop was running under full load to 28.6 degrees Celsius while the laptop was idle. (+) The maximum temperature on the upper side is 35.3 °C / 96 F, compared to the average of 33.9 °C / 93 F, ranging from 21.2 to 62.5 °C for the class Office. (+) In idle usage, the average temperature for the upper side is 26.2 °C / 79 F, compared to the device average of 29.4 °C / 85 F.
The laptop impressed us with decent sound quality while playing music files and videos. The speakers are hidden behind small openings in the notebook. Our quest to locate the speakers' exact location proved unfruitful. 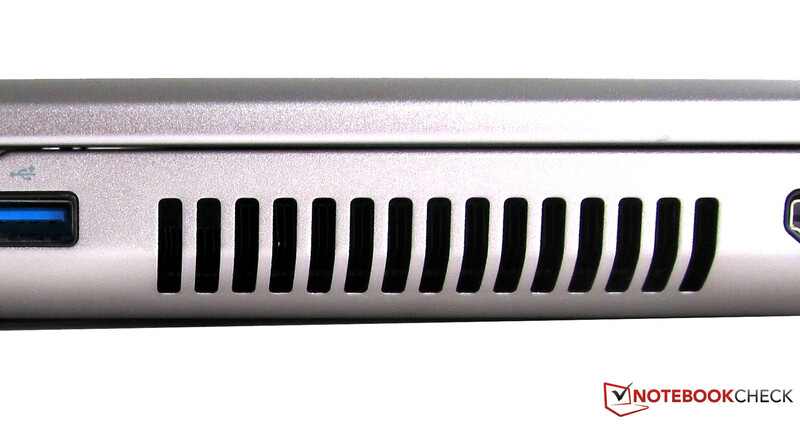 The sound emanates from below and the base of the laptop amplifies the sound. The sound output is good even when the speakers are turned up. 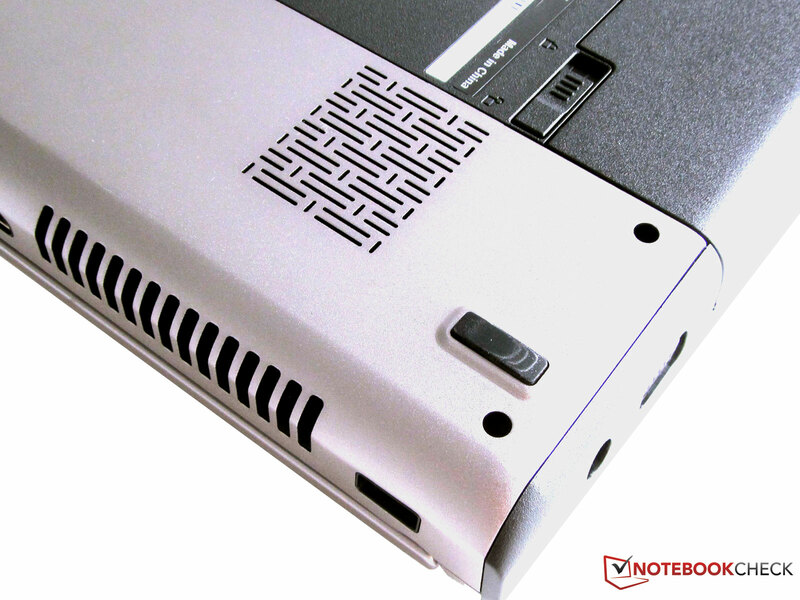 The power consumption of the Vostro 3555 in stand-by mode lies at 0.9 watts. Our measurement device showed the power consumption while switched off to be 1 W. When idle, the power consumption ranges between 9.1 to 13.3 watts. For our lowest reading, we had to put the display at minimum brightness, switch off the WLAN, and turn on all energy-saving options. The second measurement was taken with maximum brightness, high-performance profile, and WLAN switched on. These values are low for a laptop using a quad-core CPU. The highest possible power consumption (full load, maximum brightness, no energy-saving, WLAN on) lies at 55.0 W.
The battery of the Vostro 3555 has 6 cells like the one in the Vostro 3550. The Lithium-Ion battery lasted 1 hour and 23 minutes (minimum run time) in the first run of the "Classic Test" from BatteryEater. In the "Readers Test" (minimum display brightness, energy-saving options turned on) the battery ran for 348 minutes (5 hours and 48 minutes - maximum run time). The user can surf on the web via the WLAN without a power cable for 2 hours and 52 minutes. The laptop lasted 1 hour and 50 minutes while playing a DVD. Recharging the battery takes around 137 minutes (2h:17min). Interesting: although the system consumes less power and has a longer battery life while idle, the Intel-based Vostro 3550 still runs longer while surfing on the internet using the WLAN module or playing a DVD. It seems that the test model can not keep the power consumption as low in everyday use as it boasts. When closed the laptop catches the eye with its brushed aluminium surface in platinum, and when open a "black pearl" emerges. 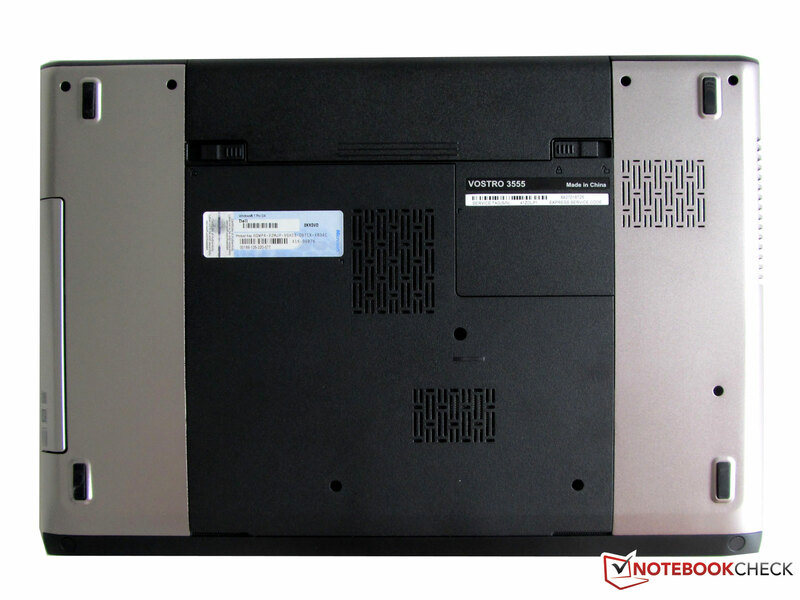 The display borders as well as the base of the laptop are made of black and matt aluminium. The keyboard and the touchpad are surrounded with a chrome border which accentuates the exquisite design further. The 15.6 inch HD (High Definition) monitor is backlit and has a native resolution of 1366x768 pixels. The display is anti-glare (matt) which means that users will not be distracted by a myriad of reflections. Unfortunately, the viewing angles are not that great and outdoors the strong colors quickly fade. On the inside of the laptop, an AMD quad-core processor (A8-3500M) runs with its integrated graphics chip (Radeon HD 6620G), 6 GBs of RAM (1x 4 GB + 1x 2 GB) and a 750 GB hard disk. The hardware proved reliable and fast in our benchmarks with very low emissions. The edges have been flattened near the touchpad. The look of the black notebook and the backlight keyboard. The 15.6 inch display could have had more stable viewing angles and the colors could have been stronger for outdoors use. The cooling system is very quiet and the temperatures remain low. 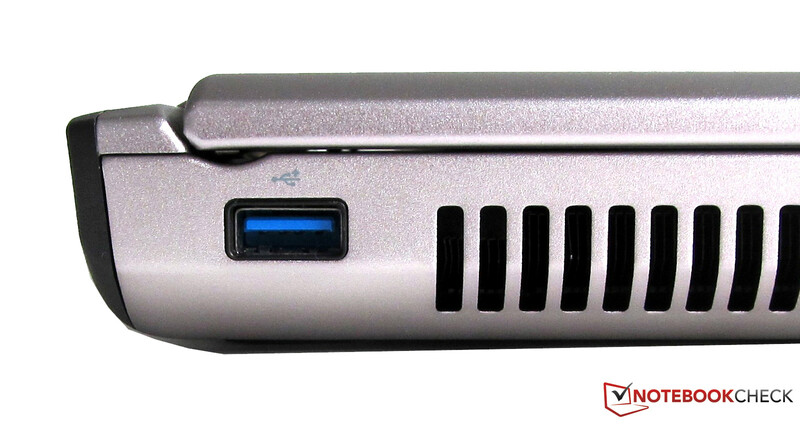 The three USB 3.0 ports are also impressive, as they are fast and well-placed.